Besides the thought of seeing my words show up as I talk (Dragon Dictate, Siri, etc. ), the thrill of watching five letters expand into 55 is pretty cool. Why would this be so cool? Precisely. In 8th grade I once typed 106 words per minute (no mistakes) – I thought that was pretty fast. (I just typed 115 with 3 mistakes on typingtest.com). So how in the world could those court reporters type 225 words per minute? Well, it wasn’t with TextExpander. Court reporting, or stenography (the process of writing in shorthand), is a whole new “language” and approach to typing, and it’s not just what a doctor gets to do with his/her signature 🙂 Stenograph machines are upwards of $5000, and require detailed training too. They have their own computer-aided transcription (CAT) software, and it’s really an entire career in itself. 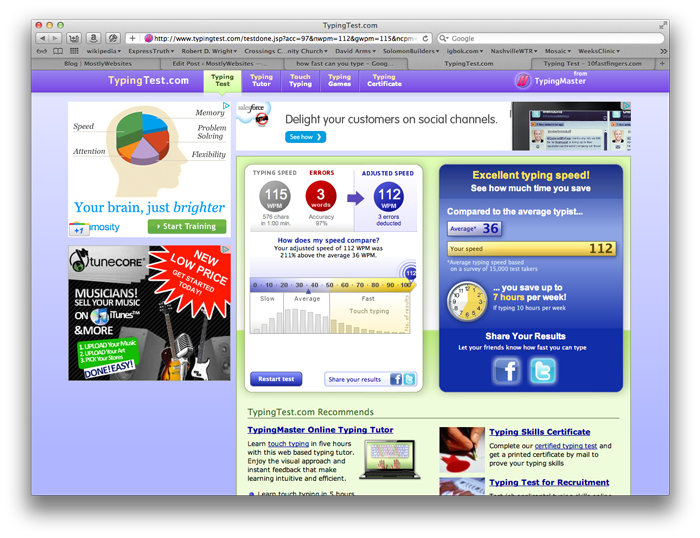 So what’s left for a guy who likes to be able to type things just a little more quickly than 106 words per minute? I’ve come to smile on TextExpander. There are some others out there – here and here – check them out and enjoy for yourself on whichever you decide.